The outgoing Education Minister pre-empted his likely demotion with his announcement yesterday. IT WAS A quiet morning around Leinster House when the email notification dropped just after 11am. 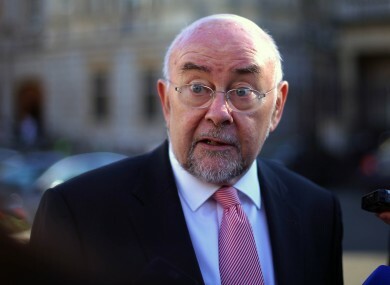 Ruairí Quinn would be making a statement on the plinth at midday. But what would he be saying? Given the speculation in recent weeks it was reasonable to suggest that resignation was in the offing, but some were even going as far as to suggest he would quit the Dáil altogether. In the end it emerged shortly before midday yesterday that Quinn was going to step down as a Cabinet minister, effectively asking the new Labour leader not to consider him in the reshuffle. He would also not be running for re-election in Dublin South-East. Just before noon journalists, photographers, videographers and media handlers arrived in their significant numbers as they often do with announcements like this outside Leinster House. The last was Joan Burton when she threw her hat into the ring for the Labour leadership in May. This was Quinn taking his hat out of the ring, deciding that it was time to step down and allow space for what he called “a new generation”. It was a pre-emptive move given the likelihood that the new Labour leader would seek to refresh the ministerial ranks and dump Quinn and other veteran ministers as early as next week. “I want to ensure that the new leader of my party – whoever that may be – has the opportunity to create their own team on their own terms,” he said . Interestingly, Ruairi Quinn spoke to Joan Burton before he resigned. But not the other Labour leadership contender Alex White? He was coy on the leadership battle that will be decided this Friday, declining to say who he had voted for as it is a “secret ballot”. But there were a couple of giveaways not least when he confirmed he had spoken to his family, the Taoiseach, the Tánaiste and Joan Burton about his decision before he announced it. But not Alex White? Then at one point mid-sentence Quinn said “I believe that our new leader, Joan” with an ever-so-slight hesitation before he added: “Or Alex.” Quinn may well have voted for White, but his remarks were indicative of the belief in Labour that it’s going to be Joan Burton. It was put to Quinn that this was an act of petulance – to announce his resignation now in order to deny Burton – or White – the pleasure of sacking him. “I don’t think I am noted for my petulance,” he insisted while acknowledging that the decision has come “sooner than I would like”. On education he said that he had given Eamon Gilmore a letter with 12 items on education four years ago and as many as eight of them are on the way to being implemented as he steps down. He talked-up Labour’s achievements in the several governments he has served in. Ireland, he said, has become a “more tolerant country” noting the legislation for divorce, introduction of civil partnerships, decriminalisation of homosexuality and “recognising the right to life of pregnant women”. He insisted several times that he had made the decision “on my own behalf” and it was nothing to do with expectations of being sacked or demoted. Quinn said his choice would not be “transferable to anybody else” as thoughts turned to the other endangered Labour minister Pat Rabbitte. Then he was back into Leinster House with more than likely just a few days left in his office at the Department of Education. A colleague near the plinth noted that it was all “very Ruairí”. Indeed, the veteran minister had done it on his own terms. Email “'How's my hair? ': Quinn brings smiles and a bit of emotion as he departs on his own terms ”. Feedback on “'How's my hair? ': Quinn brings smiles and a bit of emotion as he departs on his own terms ”.